Trophy deer hunts in Northwest Florida. The property is located eight (8) miles north of Blountstown, Florida. Located just 35 miles west of Tallahassee in the Famous Florida panhandle. Access is easy from anywhere. We have four Miles of beautiful river frontage on the Apalachicola River. We also maintain 20 food plots and 20 bait stations year round. Bow hunters will enjoy success on our 4,000 acre archery only plantation that has been trophy managed for the last 16 years. Hunters can come by themselves or in a group. If you come by your self we will pair you with one other hunter who came by themselves to pair you as a group. Your group will be assigned an exclusive portion of the property and your guide will then show you active trails and food sources within your exclusive portion of the property. Your guide will recommend areas for you to hang your stands. Most hunters have shot opportunities the first day. 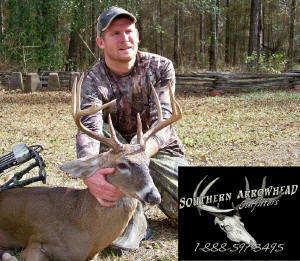 Our hunts are semi guided and are perfect for the veteran bow hunter or the beginner. 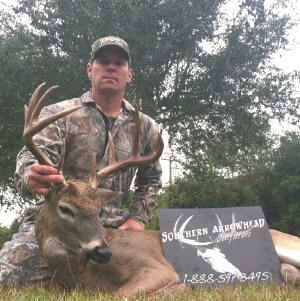 We have a lot of first time bow hunters harvest their first animal with Southern Arrowhead Outfitters. If you are tired of hunting public land with low or no success or tired of paying the high cost of being a hunt club member come hunt with us. We do all the hard work for you, all you have to do is show up, hang your stands and start hunting a private, managed, archery only plantation where you will have high success. You provide your own stand(s), license and personal needs. The hunts are five days and you may harvest two bucks, one doe, and one hog. All hunts are 5 days in length you may hunt less days, but the price is the same. The only hunts we offer are the hunts listed. We do not offer out of season hog hunts, but if you want to hunt only hogs on one of the hunts listed we can make arraignments for you to do so. Lodging is available for an additional $150.00 for the 5 days or you may stay at a hotel close by. Hunters who choose to stay with us must provide their own food as we do not serve or offer food. The property is located eight (8) miles North of Blountstown, Florida. Located just 35 miles west of Tallahassee in the great Florida Panhandle. This area is famous for having the largest deer in Florida and some of the largest deer in the South East. 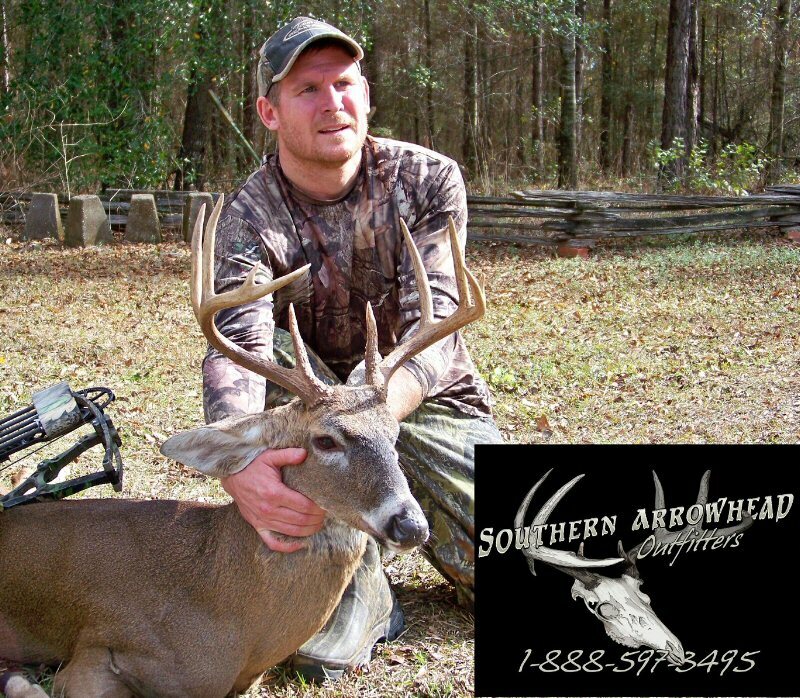 We are located only 30 minutes from Alabama and Georgia so we have the large deer and are able to hunt them legally over bait. Access is easy from anywhere. We have four (4) miles of river frontage on the beautiful Apalachicola River. We have 20 food plots and 20 bait stations that we maintain year round. Bow hunters will enjoy success on our ARCHERY ONLY 4,000 acre plantation that has been trophy managed for the last 16 years. Each hunter may harvest two bucks, one doe and one hog boar or sow. The bucks must have at least three points on one side or better to harvest. The property is teeming with deer and hogs. All hunts fill up fast. Call now for information and reservations. A simple phone call is all it takes to reserve your hunt. 1-(888)-597-3495-toll free. "A $150 non-refundable/non-transferable deposit is required to reserve your hunt. No hunts will be reserved without a deposit". The hunt balance is due the first day of your hunt. Deposits can be made by check or money order, or by VISA or MASTERCARD. Lodging is available on site for an additional $150.00 per person for all five days, or you may stay at a hotel close by. We have three full efficiencies houses on the property that offers the hunter on site lodging that is clean and comfortable. Hunters who choose to stay with us must provide their own food as we do not offer or serve food. or cancel hunts at will with a 100% refund.